The successful delivery of patient-centered care hinges on clinical affiliation for patients' personal needs and experiences. Narrative competence is a mode of thinking and set of actions that widens the clinical gaze beyond logico-scientific cognition. In this article, we investigate a tool that enables clinicians to rehearse their skills in narrative competence. We apply the narrative competence framework developed by the founding practitioners of narrative medicine to personal accounts of illness and patienthood published on the Internet. We describe our use of the five-point framework in the close reading of 214 accounts by people with the life-threatening skin cancer melanoma. Training in narrative theory and creative expression—once the domain of those studying the arts—is now recognized as a boon to effective communication in healthcare environments. Medical students and established medical practitioners are learning about story-making (Chretien et al. 2015; Miller et al. 2014) and the role it plays in their relationships with patients and colleagues (Lamprell and Braithwaite 2016, 2017). Through engagement with arts and humanities subjects, they are being given the skills to observe and reflect on the way people convey their experiences and express their needs. These skills, conceptualized as ‘narrative competence,’ help healthcare providers engage in the practice of empathic, collaborative care (Arntfield et al. 2013; Batt-Rawden et al. 2013). Programs that teach narrative competence invite healthcare providers to explore a wide range of narrative forms, from non-medical autobiographical and fictional literature and visual and performance works to case notes, medical charts and taped interviews with patients. The aim is to engage deeply with the people and stories embedded in these works by understanding how “a text’s meaning is carried in the dynamic relationship between what it is about and how it is built” (Charon 2006, 109). In this article, we investigate a narrative competence framework for reading stories of illness and patienthood published on the Internet. We describe our narrative, interpretive study of 214 personal accounts that have been written by people dealing with melanoma—an aggressive form of skin cancer. These accounts were published on the websites of organizations that support melanoma awareness and research. Unlike serialized blogs and interactive forums, these are ‘short-form’ autobiographical accounts of disease progression and care trajectories. Using a framework developed by the founding practitioners of narrative medicine (Charon 2006; Charon et al. 2016), we explored how narrative competence brings authentic, instructive and reflective engagement with the storytellers of these accounts. Recognizing that “medicine has to deal with human personality and human hopes, human fears, and human failings, in conjunction with the material body …” (Clark-Kennedy 1945, 45), physicians are mandated to be patient-centered in their practice of healthcare. Patient-centered care has a narrative imperative—to listen to patients’ stories beyond the bio-medical clues in order to ascertain patients’ personal priorities (Mattingly and Lawlor 2000). In this paradigm, physicians attend to a patient’s telling of his or her “lifeworld” (Mishler 1984) in order to engage in problem-solving care that is personally relevant and sympathetic to the patient (Barber and Moreno-Leguizamon 2017). Alongside the practice of safe, evidence-based medicine, narrative competence is a crucial proficiency in the delivery of gold standard of care. The rapid development of medical humanities departments in universities and graduate programs in narrative medicine indicates support for a narrative approach to medical pedagogy. As yet, however, there is inconsistent representation of narrative elements in medical programs. Medical education, in the West at least (Huang et al. 2017), is still steeped in logico-scientific thinking (Gupta et al. 2011). Prominence is given to comprehending the bio-medical clues that will lead to evidence-based explanations or which will guide evidence-based investigations. In this mode of thinking, patients’ stories of circumstances “that appear, on the surface, to have little to do with the question” (Riessman 2002, 2) may be perceived as digressions from the aims of a consultation. The contradictory forces potentially at play between logico-scientific medical training and the ideal of patient-centered care may be intensified by real-world medical practice. Working conditions in which there are stripped-down consultation timeframes, heavy patient loads and demanding administrative and governance requirements make it challenging for physicians to participate meaningfully in patients’ story-telling (Rosti 2017). In this environment, it becomes important for physicians in training and established practitioners to take up extracurricular opportunities for the development of their narrative expertise. The aim is to practice and rehearse the reflective, imaginative and creative thinking (Viney et al. 2015, 2) needed to “recognize, absorb, interpret, and be moved by” (Charon 2005, 262) the singular experiences of ill health (Oyebode 2010) conveyed in stories. A foundation method in narrative competence training is close attention to the narrative devices and tools used by storytellers to create their worlds. As Bamberg notes, stories comprise two inextricably linked realms: “the realm of experience, where speakers lay out how they as individuals experience certain events and confer their subjective meaning onto these experiences” and “the realm of narrative means (or devices) that are put to use in order to make (this) sense” (Bamberg 2012b, 3). Attention to the realm of narrative means is a portal to engagement with the realm of experience. Our interpretive study probed the narrative means used by patients in the stories they publish on the Internet. The accessibility and ever-expanding reach of the Web is making it increasingly possible for people to publish, and audiences to read, a wide range of personal accounts of illness and patienthood. These accounts—also called pathographies or autopathographies (Aronson 2000; Hawkins 1999a)—constitute an emerging sub-genre of narrative expression. We propose that Internet pathographies may be a relevant resource for medical providers seeking to develop narrative competence. Our study examined the pathographies of people with the highly malignant skin cancer, melanoma. We chose melanoma because it is a disease that is by anyone at any age, and its incidence is widespread throughout the Western world. Melanoma is an aggressive cancer that forms in the pigment cells of the skin (Melanoma Institute Australia 2017). It can develop in response to UV radiation, but it also occurs in non-exposed parts of the body. Melanoma is categorized clinically in five stages chiefly according to its degree of spread. It begins with Stage 0, a localized occurrence. Stage 1 refers either to the presence of metastases or an ulceration. Stage 2 signifies more advanced disease with the detection of thickening and ulceration. If the disease progresses to Stage 3, the patient now has lymph node involvement. By Stage 4, which is an advanced stage of the disease, there is spread to distant lymph nodes or organs such as the lungs, liver, brain or bone. The incidence of melanoma is rising throughout the Western world (Stamataki et al. 2015) as a result of environmental changes and also as a result of low-cost travel enabling people to travel to UV-high countries (Diaz and Nesbitt 2013). While advances are being made in chemical treatments for melanoma, particularly in relation to targeted, personalized therapies (Rebecca et al. 2012), melanoma is a deadly cancer. The diagnostic and treatment trajectory of a person with melanoma constitutes a dramatic narrative with logistical and psychosocial implications. People with melanoma face aesthetic outcomes of biopsies and surgeries (Buck et al. 2012; Lee et al. 2016), the functional and psychosocial consequences of side effects from surgery and lymph node removal (Cromwell et al. 2015; Oliveria et al. 2013), and a poor prognosis for those in advanced stages of the disease. Ongoing surveillance is necessary because melanoma can recur or metastasize many years after a primary melanoma has been removed. People with melanoma thus live with the fear of recurrence (Kasparian et al. 2016), a lifelong dependence on healthcare services and a concern for lifestyle choices that expose them to the sun (Palesh et al. 2014). Melanoma is a complex, unruly disease. We spent three months surveying the Internet to understand the environment of patient storytelling specific to melanoma. We identified a relevant and prolific source of patient stories on the websites of organizations that champion research into melanoma and provide support communities for people with melanoma. Many of these organizations offer publishing platforms for people who want to tell their stories. After securing ethical approval, we turned to these websites to establish a ‘population’ of stories for our study. In developing an approach to our reading of Internet pathographies, we explored seminal works on narrative form in life stories (Brockmeier 2000; Bruner 1991, 2004; Gergen and Gergen 1986; Genette 1988) and the narration of illness (Kleinman 1988; Mattingly 1998; Mattingly and Garro 2000). We also looked to the formative work undertaken in the interdisciplinary zones between narratology, the humanities and sociology by Arthur Frank (Frank 1995, 2010, 2011) and Anne Hunsaker Hawkins (Hawkins 1999a, 1999b). These authors extensively investigated first person accounts of illness and laid the foundations for understanding illness narratives as a genre of autobiography. For an explicit methodology by which to attend to the narrative means used in Internet pathographies, we looked to the work of Rita Charon and her colleagues (Charon 2006; Charon et al. 2016). Over the past two decades they have fostered narrative competence as a crucial proficiency for physicians (Charon 2007) and established the field of narrative medicine as a contribution to modern medical pedagogy. Their guidelines for the practice of narrative competence involve the “close reading” (Charon 2006, 116) of texts, attending to the means by which storytellers give narrative form to experience (Bamberg 2012b). They propose, and we implemented, attendance to cardinal narrative features. Unsurprisingly, searching the Internet using the terms ‘melanoma illness narratives,’ or ‘melanoma narratives,’ yielded mostly scholarly journal articles. Using obvious synonyms, such as ‘story’ and ‘account,’ yielded a wealth of material; however the content was not necessarily narrative or autobiographical or published in written form. Instead that yield included marketing material featuring patient feedback on healthcare institutions, factual information on melanoma, video and audio compilations of interviews, accounts written by the families and friends of melanoma patients, and contributions to forums. Testing search terms such as ‘personal’ and ‘experience’ yielded more refined results, with a selection comprising 286 short-form autobiographies of melanoma experiences posted to cancer support websites. The final population of 214 melanoma pathographies met the criteria. We had limited access to information about the authors of the texts, other than what could be perceived within the texts. Some stories were published anonymously, others were attributed to names that could have been pseudonyms and that did not necessarily indicate gender. Information about the nationality and geographic location of a storyteller at the time of writing was not always made explicit, and given the international nature of the Web, people living in one country were able to publish on the websites of organizations based in other countries. Thus we rarely began a reading of a story with a sense of whether the storyteller was male or female, what age group he or she belonged to or where he or she might live. It was not always possible either to know much detail about the storyteller’s diagnosis of melanoma. Some websites categorized their stories according to the staging of the disease, so stories were published, for example, under Stage 1, Stage 2, etc. Others published all stories together in order of date of publication with no differentiation related to staging. Overall, then, what we learned of the ‘profile’ of each storyteller came to us from our close reading of the texts. We were led by mentions of a gender-related experience, or descriptions of conversations with physicians that hinted at the staging of the disease, or mentions of family that hinted at the ages of the storyteller. The stories were read at least once, briefly in the first instance as part of the population selection process, again in the pre-selection process, and thereafter read multiple times. genre—the type of text determined by common codes and conventions of narrative construction. In the initial phase of analysis we established a file for each story using NVivo (v10) qualitative data analysis software. We created personal profiles for each storyteller, categorizing as much demographic, biographic and medical information as could be identified or interpreted. We then coded content according to the a priori codes of time, space, voice, metaphor and genre, beginning with ‘broad sweeps’ of content into each category. We were preparing, as we might in qualitative, paradigmatic studies, to conduct iterative coding of concepts and issues within the categories to arrive at hierarchical thematic sub-categories. We found, however, that the identification of narrative means resisted such systematic codification. ‘Voice’ for example, featured in every word of every story. Finally our analytic process reverted from paradigmatic to narrative mode of inquiry—we put each story ‘back together’ and used the coding capacity of the data analysis software to highlight and explore the uses of each narrative feature in each text. Two investigators were involved in this project. One read every story and coded the content. Discussions between us evolved the findings. In this section we present examples of our close reading of Internet pathographies. We discuss the insights into, and questions about, the storytellers’ lives that were stirred by engagement with the five key narrative features of the analytic framework we used. This section is presented in a discussion format because the work is interpretive. In choosing how to represent their lived experiences of melanoma, the storytellers had to establish an event as a beginning point. Half the stories we read began at the point in time when some kind of change in health was identified or a symptom particular to skin disease was noticed. In these accounts we enter the storyteller’s illness experience when the possibility of disease becomes apparent. We move through a timeline in which a diagnosis is made, treatment is given and an outcome is arrived at. Some stories concluded with the storyteller still in treatment, some with treatment finished and follow-up care becoming routine, and others, such as the following story, with recurrence or metastases. This story spans from early adulthood into middle age though the framing of time is imbalanced. The storyteller is imprecise about time frames in the period of events that lead from symptom to diagnosis, recounting grappling with the presence of the symptom for “several months.” This description notably contrasts with the specificity of periods of time recounted in diagnosis and treatment, follow-up care and metastases—ten days, five years, and twenty-eight years. This contrast prompted reflection about the personal circumstances of the storyteller at the time of symptom identification—what issues untold in the story might have impacted the storyteller’s desire or capacity to take action on so conspicuous a growth for such a long time? The framing of time in the text is also unbalanced by the uncertainty the storyteller speaks of. The short period of the present uncertainty casts a shadow well back into the past—though given the ‘all clear’ almost thirty years prior, it turns out that certainty was never a reality. This storyteller perceives that she may have lived with melanoma from early on in her life. Though no explicit link is made between the early years of sun exposure and the diagnosis of melanoma, and the storyteller makes no overt comment on how the diagnosis felt in light of the serious sunburns received in youth, she ends the story describing her feeling of pride in preventing her daughters from sunburn. She contrasts the lack of protection from sunburn endured as a child and teen with the present capacity as an adult to protect her own children from that danger. Possible feelings about the early sun exposure and the link to melanoma—regret, anger, guilt—are secreted into the action taken to ensure that the next generation will not have sun exposure to blame for melanoma. Her children will not have to deal with melanoma caused by sunburn in their lifetimes. Implicit in this story, as in the previous story, is the vague passing of time from symptom appearance to medical advice. The storyteller narrates that she was at sophomore level in high school—which marks an age of between fifteen and sixteen years of age—when the mole appeared and eighteen years old when changes in the mole and other symptoms of ill health prompted the decision to consult a doctor. The appearance of the mole was not enough of a physical change to warrant seeking medical advice. It seems that some two years may have passed from the time the physical change was noted through to the time diagnosis was made and an excision was performed. The storyteller’s self-confessed naivety about skin cancer may have contributed to extending the time in illness. While this chronologically organized list of events—this happened then this happened—lacks explicit reference to the physical, psychosocial or practical impacts of the experience, there are implicit clues to the significance of the experience for the storyteller, based on the way time is situated in the story. The storyteller notes, for example, that December 31—the day of the first diagnosis of melanoma—is New Year’s Eve. Though no explanation is given as to why this detail was included or what meaning this date held for the storyteller, we know that the eve of a new year signals renewal and regeneration—a time when it is customary to make positive resolutions about life going forward. We reflected on the impact on our own lives of receiving a diagnosis of cancer at such a time and by empathic inference we could project how diagnosis on this date may have affected the storyteller. We noted that the stark lack of descriptive detail about events and personal feelings in this story served to illuminate the passing of time. The story ‘slides’ quickly from diagnosis, through four surgeries in five years, to arrive an outcome of another, worse, diagnosis. We wondered if this was the storyteller’s way of emphasizing the role medical treatment had played in that five-year period. We were prompted to consider the storyteller’s experience in the broader context of treatment for melanoma, and to reflect on the limits of surgical intervention in managing this aggressive disease. Four surgeries in five years could not contain the advancement of the melanoma. “I can show you, though, in pictures the difference just a week makes from pre-chemo to one week into chemo. These photos were taken exactly one week apart. I almost didn’t recognize myself in the second photo. The consequence paid for the treatment of this devastating disease was a detachment from the true body and spirit. I can only equate it with a loss of myself. The essence that is Me was gone. I thought at the time that I would never recover that original person that I was. I felt she was gone forever, only to be replaced with a much weaker, feeble version of who I was. My delusion of continuing a near normal life during chemo was long gone…”. Encouraged by new membership of an online community and the increasing ease of publication on the Internet, some storytellers were writing for the first time about events that took place many years ago. Others recounted multiple experiences of melanoma that occurred across decades. Reading individual accounts of historic experiences made us wince in the knowledge that the story might have been very different had the storyteller been diagnosed in a more modern context. The stories exposed times in the past when public awareness of melanoma was limited, when sunscreen lotions were not widely used and when commercial tanning clinics could use high-risk devices. Attending to time as a narrative feature of these pathographies allowed us three main ‘points of entry’ into the lives of the storytellers: chronological time as a platform for the unfolding of experiences; the passing of time as a gauge by which storytellers assessed the impact of their experiences; and historic time as a view of the shifting issues individuals have dealt with. Time also featured as an implicit aspect of the relationship we developed with each storyteller—the time we spent reading and re-reading a pathography and then the time spent thinking about that storyteller long after our study was competed. Our reading of these pathographies visited storytellers at a particular time in their lives, and we were keenly aware that the circumstances of their health and their lives overall may have shifted significantly since the time of writing. A question lingers: what happened to that person? Unlike the experience of reading serialized blogs, a reader of short-form Internet pathographies is given a snapshot into a person’s life and point of view at a particular time, and then left to wonder. The certainty that things have changed since the story was told forms a “continuity/change dilemma” (Bamberg 2012a): we must attend to the story at hand and become absorbed in the life that is being told and yet attend with equal commitment and imagination to the changes that may have occurred in the time since the story was written. In attending to space as a narrative feature, we became aware of the ways in which physical realms and geographic entities shaped storytellers’ recall of their experiences. Simple references to locations such as clinics and car parks became meaningful as storytellers described the personal significance of the events that occurred in those spaces. Our engagement with storytellers was perhaps most highly drawn by their portrayals of bodies as physical spaces undergoing transformation. Given the aggressive and recurrent nature of melanoma, storytellers’ accounts often told not only of significant aesthetic and functional consequences of melanoma and melanoma treatment but of the ways in which the changing spaces of their bodies shifted their fundamental perceptions and beliefs. By attending closely to the linguistic components of the pathographies, we developed an awareness of how storytellers composed their texts to reflect a particular voice. Punctuation was a foundational tool for storytellers who wanted to create a sense of fervor in the text. Intensity of feeling was indicated by extensive use of exclamation marks, question marks and capital letters, extended ellipses and typographical symbols to indicate swearing. The choice by one divergent storyteller to use the third person point of view highlighted the complex relational act we engaged with in reading these pathographies. Why had this person decided on the use of the third person in the telling of her lived experience? We wondered if the intention was to distance herself from the experience, to engage our attention by being different, or perhaps to bring her experience into a literary domain. Through our focus on the use of metaphors, we witnessed the use of figurative and symbolic language to describe and explain thoughts and feelings. We noted that some storytellers developed original metaphors while others employed metaphors that are universally shared. We observed the ways in which these metaphors shaped storytellers’ personal and communal identities. Metaphors appropriated from the identity narratives of the wider cancer community, for example, positioned storytellers as selves at war with melanoma. We noted also that the kind of metaphor used was a mediating factor in our level of engagement: the more familiar the metaphor, the more quickly we understood the storyteller’s meaning, though it was also true that metaphors which were original and highly personal demanded greater consideration and compelled a deeper engagement with the text. In our readings of the 214 stories we became aware of a pattern in the construction of these texts. The descriptive narrative of events—the ‘what happened’ of the story—was structured to unfold in chronological order leading from symptom recognition or diagnosis through to outcome, but was often ‘topped and tailed’ with personal commentary. These introductory and concluding aspects of the texts can be conceived in literary terms as prologue and epilogue. Using these structural devices, the storytellers introduced themselves to their audiences, and expressed their overall thoughts and feelings about their experiences of melanoma and melanoma treatment. Most (78%) storytellers used an epilogue to complete their pathography. In their epilogues, storytellers summarized what had been recounted and reflected on the personal significance of the experience of melanoma. Prologues and epilogues featured repeatedly in the Internet pathographies we read, establishing these structural devices as conventions of the genre. By bookending their chronicles of events with commentary, storytellers would lead us from their present thoughts and feelings into their past circumstances and then bring us back into the present or take us into their projected future. The persona of storyteller in a prologue and epilogue was that of the current ‘self’—the self who was writing—contrasted with the self that existed and evolved in the unfolding events of the narrative. In developing an awareness of these conventions, we became attuned to the way that storytellers might recount their experiences, and sensitized to the scope of perspectives storytellers might offer on their experiences. We conducted a close reading of 214 web-based autobiographical patient stories. Our goal was to profile narrative competence through engagement with both form and content of online narratives of people with melanoma. We investigated the kinds of insights into patients’ personal experiences that might be gleaned using a framework of five narrative features as interpretive prompts—time, space, voice, metaphor and genre. To our knowledge, this framework has not previously been applied to patient stories published on the Internet. The outcomes of our analysis highlight the ways in which a five-point narrative competence framework widens the clinical gaze. Taking time, space, voice, metaphor and genre into account when thinking about a patient’s story navigates healthcare providers directly into the patient-centred point of view that enriches the quality, safety and relevance of clinical assessment and overall care. In our presentation of our findings, we chose to discuss each a priori narrative feature, using examples from texts. We might also have chosen to focus on a selection of whole pathographies, investigating the function of each narrative feature within a single text. This may have yielded different kinds of insights about the storytellers and their experiences. We may also have attended to the influence of online communities on the choices of content, narrative structure and language made by storytellers. We saw, for example, how the use of some metaphors linked storytellers to wider personal, social and political narratives of cancer, promoting messages of adversarial perceptions of disease and heroic transformation. If cultural narratives inform storytelling, so too do ‘organizational narratives’ (O'Brien and Clark 2012). The narrative choices made by these storytellers may be influenced to greater and lesser degrees by the organizations that sponsor the websites on which the stories are published. Following guidelines and suggestions for content established on these sites and reading other stories published on these sites may shape the choices made by these storytellers. Though the aim of narrative competence is to affiliate with the experience of individuals, our reading of multiple accounts offered the opportunity to consider and systematically investigate commonalities and patterns in the conventions of Internet pathographies. Had our study been conducted in the paradigmatic (Bruner 1986, 12) mode of narrative inquiry, we might have systematically investigated the pathographies for thematic, probabilistic findings on the use of narrative devices in web-based texts of people with melanoma. Rather our study was a “narrative mode” of narrative inquiry (Bruner 1986, 13)—an interpretive examination of the practices of narrative representation in individual Internet pathographies of melanoma. We drew on narrative theory as a means of gleaning, understanding and explaining aspects of singular lived experience that was not necessarily explicit in the verbatim discourse (Lopez and Willis 2004). Thus our focus was on the way personal choices in narrative representation illuminated the experience of the individual. Our broad intention was to honor the efforts of people with melanoma who have told their stories in public forums by attending to their accounts of self and their descriptions of their circumstances. The power of a narrative process to articulate and share personal experiences becomes identifiable in this study’s close reading of melanoma illness stories. Through their structural and linguistic choices in story-telling (genre), their framing of events in past and current contexts and imagined futures (time), their presentation of places and bodies as sites of meaningful transaction (space), their establishment of narrative tone, style and perspective (voice), and their varied approaches to using symbolic and figurative language (metaphor), these storytellers invite our affiliation with their experiences. With the practiced competence to attend to such narrative features, patients’ stories become a resource for patient-centered care. The authors are deeply appreciative of the time and effort taken by the storytellers to write and publish the accounts that have formed the basis of our study. Klay Lamprell’s work is supported by the provision of an Australian Postgraduate Scholarship. Jeffrey Braithwaite’s work is supported by NHMRC Program Grant, APP1054146, and a NHMRC Centres of Research Excellence Grant, APP1135285. Bamberg, Michael. 2012a. “Identity and Narration.” In The Living Handbook of Narratology, edited by Peter Hühn, Jan C. Meister, John Pier, and Wolf Schmid, http://www.lhn.uni-hamburg.de/article/identity-and-narration . Hamburg University. Brockmeier, Jens. 2000. “Autobiographical Time.” Narrative Inquiry. https://doi.org/10.1075/ni.10.1.03bro. Cromwell, Kate D., Yi-Ju Chiang, Jane Armer, Puncky P. Heppner, Kristi Mungovan, Merrick I. Ross, Jeffrey E. Gershenwald et al. 2015. “Is Surviving Enough? Coping and Impact on Activities of Daily Living among Melanoma Patients with Lymphoedema.” European Journal of Cancer Care. https://doi.org/10.1111/ecc.12311. Diaz, James H., and Lee T. Nesbitt. 2013. “Sun Exposure Behavior and Protection: Recommendations for Travelers.” Journal of Travel Medicine. https://doi.org/10.1111/j.1708-8305.2012.00667.x. ———. 1998. “Just Listening: Narrative and Deep Illness.” Families, Systems, & Health. https://doi.org/10.1037/h0089849. Gupta, Richa, Satendra Singh, and Mrinalini Kotru. 2011. 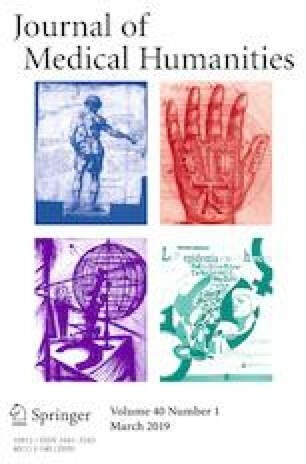 “Reaching People through Medical Humanities: An Initiative.” Journal of Educational Evaluation for Health Professions. https://doi.org/10.3352/jeehp.2011.8.5. ———. 2017. When Patients tell Their own Stories: A Meta-narrative Story of Web-based Personalized Texts of 214 Melanoma Patients’ Journeys in Four Countries. Qualitative Health Research. https://doi.org/10.1177/1049732317742623. Melanoma Institute Australia. 2017. “What is Melanoma?” Accessed 1 May 2017. https://www.melanoma.org.au/understanding-melanoma/what-is-melanoma/. Oliveria, Susan A., Elyse Shuk, Jennifer L. Hay, Maureen Heneghan, Jacqueline M. Goulart, Katherine Panageas, Alan C. Geller, and Allan C. Halpern. 2013. “Melanoma Survivors: Health Behaviors, Surveillance, Psychosocial Factors, and Family Concerns.” Psychooncology. https://doi.org/10.1002/pon.2059.